Around the world, farmers’ rights to seeds are imperilled by industry-pushed reforms to curtail the freedom to save, reuse, exchange, and sell seeds. This is because, for the industrial seed market to grow, more farmers must rely on seeds bought from corporations, rather than seeds saved from previous harvests. 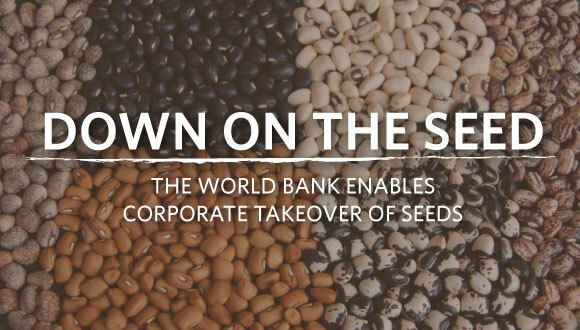 The Oakland Institute's new report Down On the Seed, the World Bank Enables Corporate Takeover of Seeds, exposes that the World Bank's Enabling the Business of Agriculture index reinforces the stranglehold of agrochemical companies and Western nations. Today, six Western firms control over two-thirds of industrial seed sales – a market valued at approximately $50 billion in 2014. But there is still more money to be made. Though its mandate is the alleviation of poverty, the World Bank has undertaken a mission to create the conditions for that, and is now working to expand farmers’ dependency on large suppliers of agricultural inputs. The World Bank has designed an index, the “Enabling the Business of Agriculture” (EBA), that scores countries on whether or not they implement intellectual property rights (IPRs) in agriculture to allow companies to profit from the use of their seeds by farmers. The EBA advocates for the reduction of the cost and time to register industrial seeds. It also benchmarks how easy it is for the private sector to access genetic resources in national seed banks, to be accredited to conduct seed certification procedures, and to achieve predominant representation in the committees deciding to introduce new seed varieties in countries. While such reforms will swiftly expand seed companies’ markets, they threaten farmers’ rights and livelihoods. The EBA overlooks that seed saving and exchange practices supply 80 to 90 percent of farmers’ seeds in developing countries and provide access to cheap and diverse varieties, which is crucial for climate change adaptation and food security. In Papua New Guinea, for instance, farmers grow on average between 30 and 80 species of food crops. In addition to ensuring nutritious diets, this diversity is a buffer against weather-related crop failure, as the wide range of varieties includes crops adapted to grow despite excessive rains or prolonged droughts. In sharp contrast, the industrial system upheld by the EBA produces standardized seeds and focuses on varieties that can be commercialized on a large scale (corn, soybean, cotton, etc.). In the 1960s, the input-intensive Green Revolution in Asia and Latin America led to a massive loss of plant varieties (e.g. 4,000 traditional cultivars of rice were lost in the Philippines, 15,000 in Indonesia, replaced by just a handful of industrial varieties). The World Bank’s approach does not only undermine seed diversity, it fosters dependency on increasingly expensive inputs. In the US, market concentration and overwhelming reliance on industrial inputs have led to seed prices more than doubling relative to the price farmers receive for their crops over the past two decades. Farmers’ disempowerment in the face of market concentration will worsen with mergers planned between the largest input companies in the world. The Bank’s failure to consider the EBA reforms’ social, economic, and environmental impacts is shameful. In January 2017, 157 NGOs, farmer groups, unions, and academics from over 40 countries wrote to World Bank President Jim Yong Kim and to the EBA’s five Western donors to demand the immediate termination of the project. These groups stress that the World Bank should work to support farmers, not large agribusinesses. They view the scrapping of the EBA project as a first step to create space for rural communities’ involvement and consultation in agricultural policymaking. Will the Bank and EBA donors hear their demand and put an end to pro-corporate benchmarking schemes? If not, they will have to face the growing mobilization of people and organizations around the world who reject the hijacking and the privatization of seeds, the most essential source of food and life in our planet.